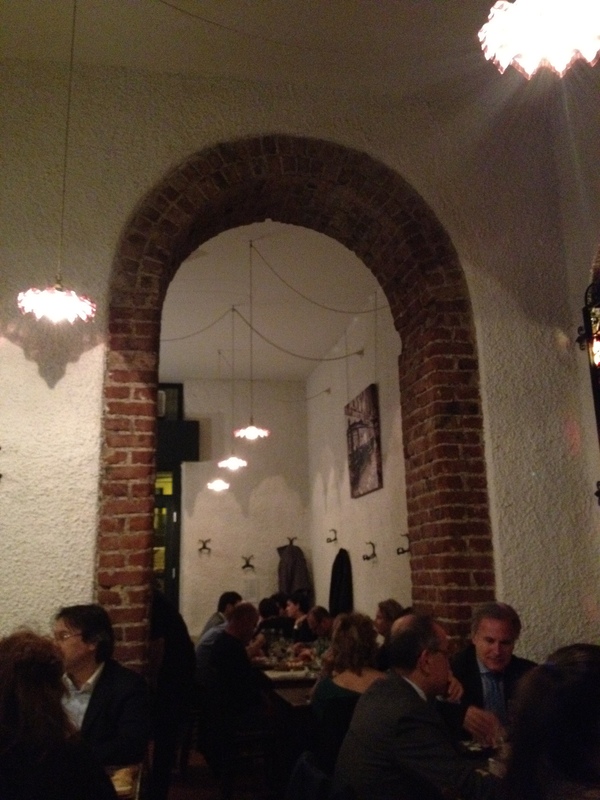 Low-key is a good word for the newly Michelin-starred Al Pont de Ferr, along a quiet canal on the south side of Milan. With simple archways framed in red brick, stark white walls, and wood tables, the interior suggests humbler beginnings. Actually, I had tried to walk in at 7pm, except the restaurant does not open for dinner service until 7:30pm. Oops. Once seated, the waitress started off about the menu in very rapid Italian, and apologized when I awkwardly volunteered, “…English?” because apparently I had said grazi like a local. I suppose there’s a silver lining in everything. 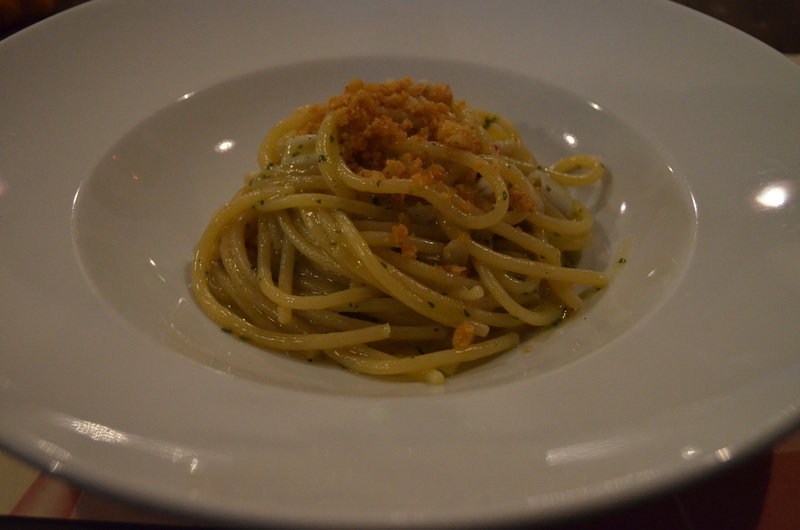 The menu was concise, and the descriptions seemed to purposefully understate the dishes, which arrived with much more inventiveness and boldness than what I had expected. That, and the bread plate was really good, almost a dish unto itself for all its diversity in miniature (the glazed pain au raisin was a nice bite of contrast while I was in the middle of the Iberico pork). A soft beginning note, my amuse-bouche was a sweet pumpkin crème with yogurt sorbet and a beef-tartare-stuffed tomato. Next, an appetizer of apple-wrapped sardines with mint, squid ink, and carrot and orange sauces (unfortunately, I cleaned this dish up before I remembered to get my camera). Spaghettoni di grano duro. That anchovy sauce was delicious, and quite pungent. I thought I was done after the spaghettoni, but the waitress told me I should make room for the Iberico pork, cooked al forno and plated with dabs of burrata. Black Iberian pig, Spain’s acorn-fed prized culinary creature, is best known in its cured form (jamon iberico), and according to Wikipedia, for its “capacity to accumulate fat under its skin and between its muscular fibers.” The meat is therefore richly marbled and thick with flavor, unlike any other pork I’ve ever had. That the cuts were seared, salted, and crisp on the edges gave the dish the effect of many bites of really good, fattier prime rib. Iberico pork al forno with burrata. I made room, believe me. 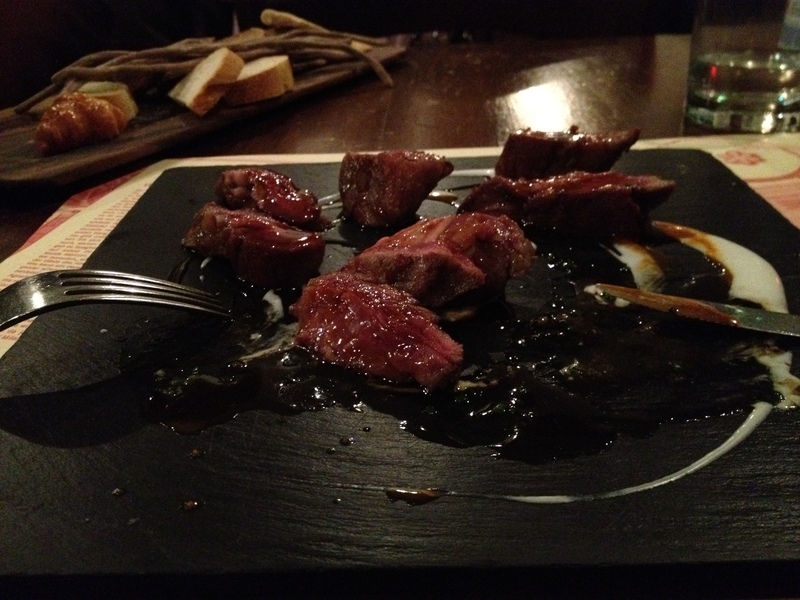 Again, way more ambitious a dish than I had bargained for, and a surprise for this random corner of Milan. I would have liked to have seen what the place looked like in the two or three years prior, but whatever the case, they really earned that first Michelin star. Starters: everybody else ordered a (1) rose-colored onion dish that looked like a blown-glass sculpture (la cipolla rossa); I had the (2) sarde appetizer. 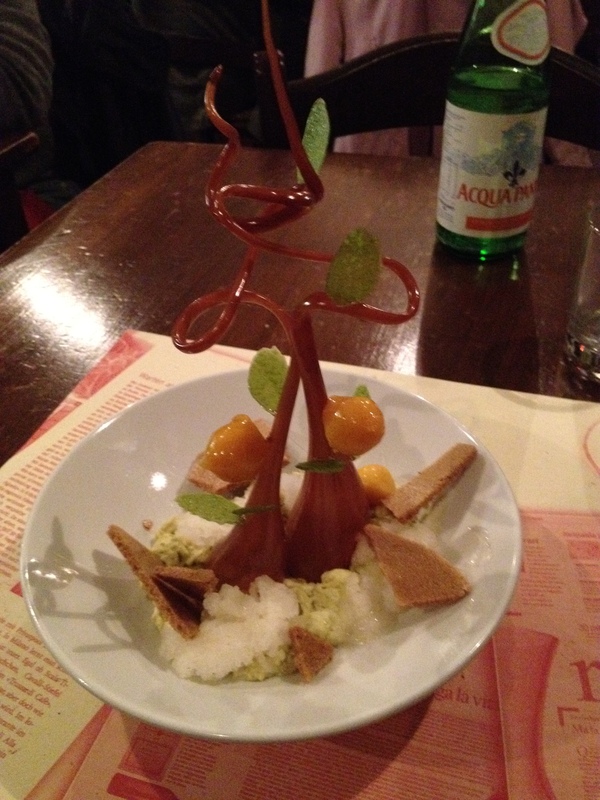 Dessert: I’d recommend trying something else besides the orange tree.